It’s not just coffee in Seattle – there’s wine too! One of the exciting things about visiting the wine regions of Oregon and Washington State is how different the experience is between the states. Conveniently grouped together with Idaho as the Pacific Northwest, I don’t think that the majority of Oregon wines and Washington wines – or for that matter Oregon wine regions and Washington wine regions – have anything in common except perhaps that they are nothing like their California counterparts. The wine regions of Washington State are nearly all east of the Cascade Mountains in semi-desert areas, traditionally apple-growing country, where irrigation is essential. It is often very cold and dry in the winter, and very hot and dry in the summer, but the great advantage is the high number of sunlight hours in the vines’ growing season. For the USA (with the exception of Alaska) this is as far north that you can get, at around 46° Latitude. With a long growing season, it’s a climate that happens to suit Bordeaux grape varieties and Merlot in particular, something that was discovered long before the variety became fashionable in California. Fortunately, Washington wine growers have always been quite adventurous in their choice of grape varieties, definitely not slaves to fashion. In January, I tasted a range of both red and white wines from Washington and found a great variety of styles with good quality though the reds definitely have the edge. In the past 20 years, winery numbers have exploded and Washington State is the second largest wine producing state in the USA after California. Anyone who read the post I wrote on my last visit to Oregon may perhaps guess that, like many people, I visited Washington on the same trip; that was 19 years ago and I haven’t yet found the opportunity to return. We started in Seattle, already a vibrant city and close to there we visited the most-established wineries, Château Saint Michelle and Columbia both of whom had decided it was easier to set up their wineries close to the city, even though they had to bring the grapes across the Cascade mountains. We were given a private tour of Columbia winery by one of the partners, Master of Wine David Lake. Insisting that we did a barrel tasting he ushered us up a ladder to the high-level barrel store – and when I asked where I could spit out the wines, he pointed over the edge – it was the highest spit I’d ever done … ah, happy wine travelling memories! When we did cross the Cascade mountains to tour the vineyards and visit a couple of the very few wineries over there at the time, we were really excited to drive by Snoqualmie Falls, which at the time was famous for the TV series Twin Peaks. Today wine tour companies offer combined visits to wineries and the Falls – that’s how far the tourism offering has come. Seattle, home to Starbucks, MSN, Amazon and Boeing among others, is a thriving, multi-cultural and entrepreneurial city. The easy access to plenty of outdoor pursuits (both water/coastal and mountain activities) makes it an attractive place to live, so with a population eager for a range of weekend activities it’s not surprising that wine tourism close to home is high on the list as a leisure pursuit. Today there are around 40 tasting rooms just in the Seattle area, but you can also take a half-day drive over the Cascades to the Yakima Valley or perhaps more interesting, to Walla Walla. Gary Werner, director of the Washington Wine Commission, a former wine writer based in London, described Walla Walla to me as becoming a little like Healdsburg in Sonoma – an attractive town with 18th century buildings and a growing restaurant offering. Though still not many, a few winery restaurants have been established and accommodation out of Seattle is becoming much more available. Whilst waiting for Wine Travel Guides to expand in that direction, you can plan a wine tour on the Washington Wine Commission’s website which has details of the wineries open to visitors and the facilities they offer. It’s another place on my list. 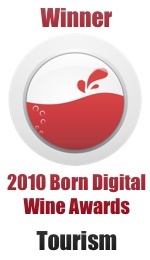 This entry was posted on Sunday, March 22nd, 2009 at 1:39 pm and is filed under Wine Tourism General. You can follow any responses to this entry through the RSS 2.0 feed. Both comments and pings are currently closed. 2 Responses to It’s not just coffee in Seattle – there’s wine too! You’ve got a typo here in the first paragraph. Instead of Ohio, it should read Idaho…. I better know. I grew up in Columbia Valley, studied in Willametee Valley and my family has a home at a ski resort in Idaho. Those three states, along with British Columbia over the border in Canada are generally considered to be the official “Pacific Northwest”. I just returned from an extensive wine trip there and what a dynamic region it is! Julia – thanks so much! I remember questioning Idaho/Ohio and doing a quick (much too quick) search. Serves me right. I can’t wait to go back there sometime.